Professor Dr. Winterkorn has resigned as Volkswagen CEO after the Environmental Protection Agency (EPA) issued a Notice of Violation (NOV) to Volkswagen for “using a defeat device in cars to evade clean air standards" which "is illegal and a threat to public health”. Exposure to these nitrogen oxides (NOx) pollutants has been linked to a range of serious respiratory illnesses that can cause hospitalization or even premature death. Children, the elderly, and people with pre-existing respiratory disease are at higher health risk from these pollutants. 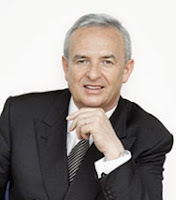 In a statement Winterkorn said, "I accept responsibility for the irregularities that have been found in diesel engines and have therefore requested the Supervisory Board to agree on terminating my function as CEO of the Volkswagen Group. I am doing this in the interests of the company even though I am not aware of any wrong doing on my part." The NOV alleges that four-cylinder Volkswagen and Audi diesel cars from model years 2009-2015 included a sophisticated software algorithm that detects when the car is undergoing official emissions testing, and turns full emissions controls on only during the test. This results in cars that meet emissions standards in the laboratory or testing station, but during normal operation when they emit nitrogen oxides (NOx) that contribute to nitrogen dioxide, ground-level ozone, and fine particulate matter, at up to 40 times the standard. The software produced by Volkswagen is a “defeat device,” as defined by the Clean Air Act. The software circumvents EPA emissions standards for certain air pollutants. California is separately issuing an In-Use Compliance letter to Volkswagen. The EPA and the California Air Resources Board (CARB) have both initiated investigations based on Volkswagen’s alleged actions. The allegations cover roughly 482,000 diesel passenger cars sold in the United States since 2008: Jetta (Model Years 2009 – 2015), Beetle (Model Years 2009 – 2015), Audi A3 (Model Years 2009 – 2015), Golf (Model Years 2009 – 2015) and Passat (Model Years 2014-2015). VW may be liable for large civil penalties and injunctive relief for the violations alleged in the NOV which could cost VW billions of dollars not only in fines but owners' class action lawsuits and lost business due to distrust. Before announcing his resignation, Winterkorn pledged to "do everything necessary in order to reverse the damage this has caused."